UPDATE: An updated version of this gateway install guide is published here. The rest of this post is kept here for legacy purposes, some links to source files might be obsolete or not work any longer, please see the linked guide above for the latest code and walkthrough. 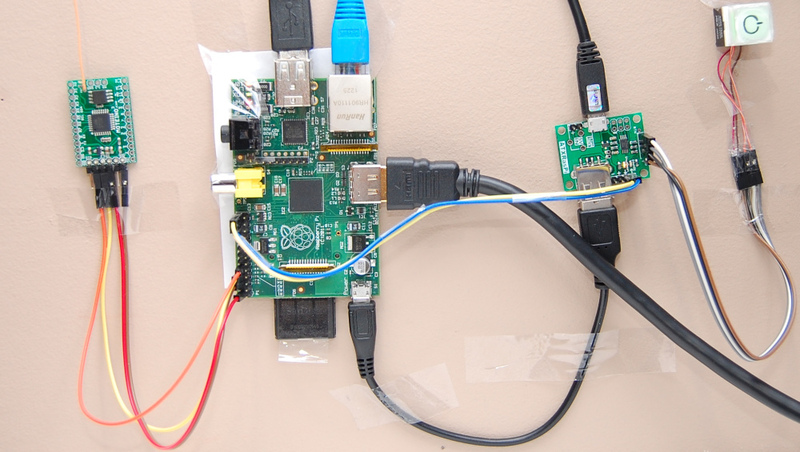 In this last part of the RaspberyPi home automation gateway series I will show an example of hardware implementation that talks to the RaspberryPi secured realtime home automation gateway, and share the firmware source code. GarageMote is a garage door controller shield that can be used to remotely control a garage door from anywhere on the web or from your smartphone. GarageMote was created for several reasons. Mainly because as I’m adding more Moteino based home automation devices around my property, one of the nice things I wanted to be able to do is control the garage door remotely. It’s become so routine to close the garage door when I leave from home that sometimes when I’m already 5 or 10 minutes away I wonder if I actually closed it. And so I want to be able to check the door status and close it if it was left open by mistake, without having to drive back home. Or maybe it’s useful to be able to let someone in without giving them the garage code every time. In the previous part of this post I described the conceptual high altitude picture of a secured, realtime home automation gateway. In this part I will go into more detail and show some of the issues I’ve faced and and solutions to address them. First, the webserver had to be put behind a mandatory SSL connection. All incoming HTTP port 80 traffic would be permanently redirected to secure sockets layer port 443. That was pretty easy with a self signed SSL certificate and some webserver configuration. Then HTTP basic authentication was put in place so that users would first need to be authenticated before web access would be granted. Again, not too complicated, using a .htaccess file and some changes in the webserver config file. Custom authentication can also be implemented, but for the purpose of this tutorial basic auth is good enough. The title is actually incomplete but didn’t want to make it too long. What I’m about to describe is an initiative on how to put together an encrypted, authenticated, realtime, RaspberryPi powered home automation gateway. It will be a few separate posts that will go from concept to implementation, using a real world example of how to control something in the house. I’ll break it down and explain the big picture and each part that needs to be addressed. But first, a little more background and reasoning behind this effort. Above you can see my temporary gateway setup. 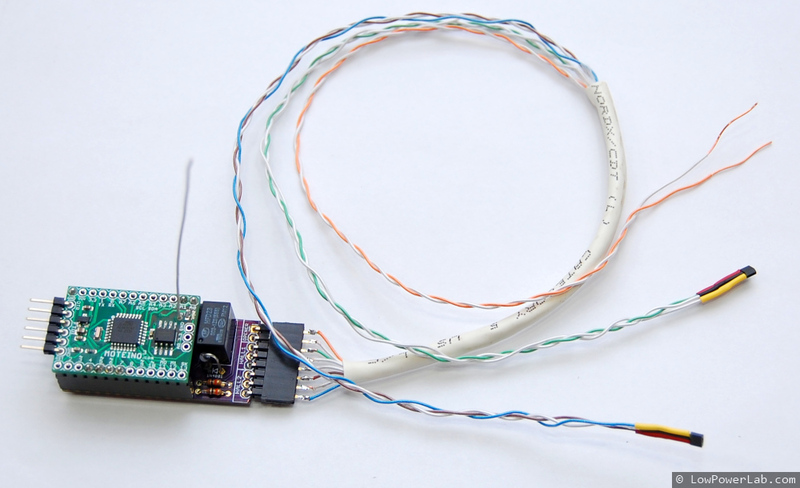 It’s very simple – I have a RaspberryPi powered through an ATXRaspi, and a Moteino which acts as the gateway to my wirelessly controlled house. It’s hard wired to my home router because the wireless adapters are simply junk, not reliable. Also hooked up to a monitor and keyboard. I started to look into websockets for RaspberryPi. My Pi is overclocked at 900Mhz and it’s stable but even so it became apparent that loading it with too many HTTP requests for various things (streaming data into EmonCMS works over HTTP) can get slow. So here’s a simple working Hello-World websockets example in Python, using the popular Tornado websocket library. It’s a very simple echo program, but I think proves the point that websockets are much faster than HTTP requests since they are a direct link between the server and the browser.